Color and design trends change; we see this shift in the contemporary materials and colors being used in meeting spaces and offices. It’s no wonder that the popularity of Conference Table Pads continues to expand along with these advances. Their minimalist design and clean lines make them especially versatile, either adding an elegant layer in a traditional boardroom or a sleek appearance in a contemporary setting. Their practical use has application protecting wooden table tops or offering an ideal writing surface on stone or glass. 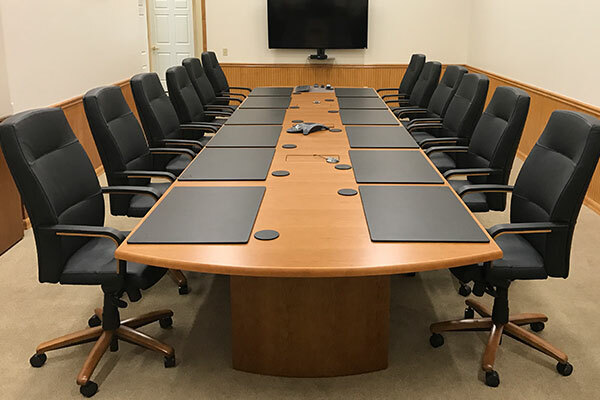 To keep up with the growing needs and requests of customers, we’re pleased to announce two new colors now available in the 17” x 14” Conference Table Pad size – Gray #P4215 and White #P4415. Gray is another neutral so it easily blends with lighter and darker hues of the same or as a complimentary color accent. It goes without saying that bright white pads bring high contrast and a modern feel – a great accessory for vibrant, sleek backgrounds. They also provide the ultimate blank canvas, ideal for our new full color printing options (more on that later!). 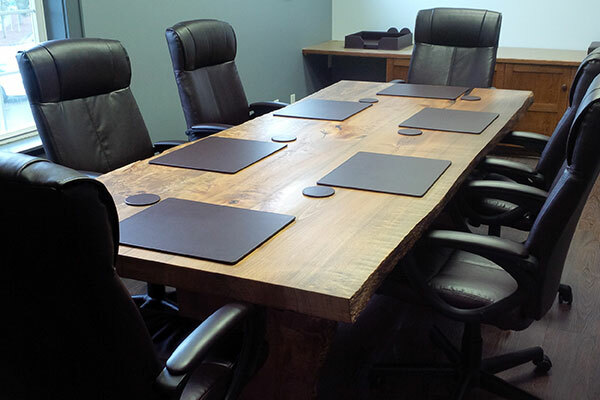 We recently worked with a client who needed to outfit their new boardroom. Their beautiful marble table top takes center stage in the room. 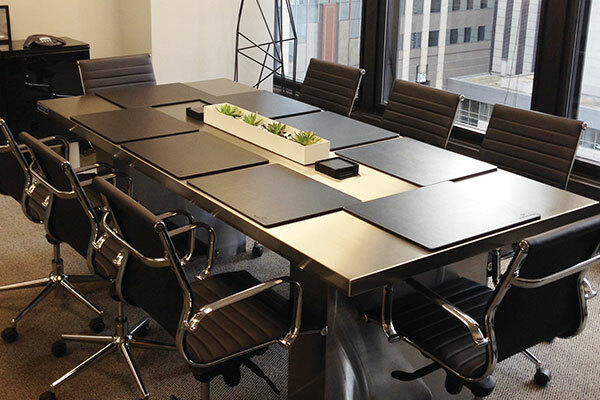 After viewing samples, they chose the Gray Leatherette Conference Table Pads as their next accessory. I think anyone would agree, these add a stunning layer which highlight the veining of the stone, rather than distract or hide that unique and organic feature. Each pad was debossed with their logo adding a sophisticated touch that personalizes each guest’s experience, when seated at the table. The end result is a breathtaking room, each component compliments the other. Most importantly to us however, is knowing that our client is pleased. That’s the best conclusion. 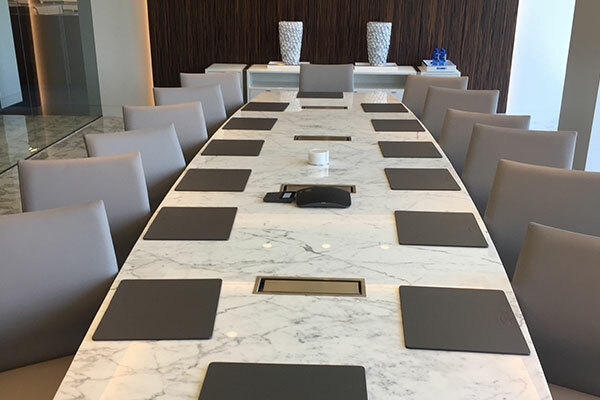 The same idea of using natural stone as a table top is also being implemented in the office, to create elegant workspaces. The look can vary and be influenced by the “movement” found in the stone. For those looking to make a statement, significant patterns may be chosen to give a bold impression. On the opposite side of the spectrum, little variation may be selected to create high-end appeal.In either case, desk accessories can soften the space and help create a comfortable, organized work area. first saw this statement piece when working with this CEO to determine the best color to accessorize his desk. Once that variable was known, he listed the items that would be useful in his daily routine. Many of the products were stocked, so they shipped right away, but others were custom made. Now that the components are assembled, the look of his office is memorable. The combination of these organic materials, stone and top-grain leather, seem to go hand in hand. The leather enhances the color and character of the stone making it an ideal pairing. We understand the need to match or accentuate your furnishings and interior space. Our knowledgeable team is available to assist by providing swatches or samples to ensure that you're thrilled with the finished product! The Situation Room of the White House, or as known by its official title the John F. Kennedy Conference Room, is one of America’s most historic meeting places and intelligence centers. When this busy, mission-critical meeting facility neededconference table accessories, they chose our Black Leather Conference Table Pads. Our pads were installed in the room during the first major renovation of the Situation Room, and we are very proud to that they have served 3 different U.S. Presidents without being replaced! The Situation Room was founded in 1961 per the orders of then-president John F. Kennedy to combat the lack of credible information the United States had available during the Bay of Pigs incident. During the rooms construction it had secure communications systems installed that provide live audio, video and other forms of communication. The Situation Room also features some of the most dedicated staffers our country has to offer, tasked with keeping watch on certain sectors of the globe around the clock to keep the White House updated on national security matters or significant worldwide events. One of the most crucial tasks for the group operating the Situation Room is their preparation of the "Morning Book". The book is written each morning for the President, Vice President and White House select senior staff and contains the newest National Intelligence Daily, The State Department’s Morning Summary, plus diplomatic cables and intelligence reports. Also included in this ritual by the Situation Room is the President's Daily Brief, prepared each day by the Office of the Director of National Intelligence. 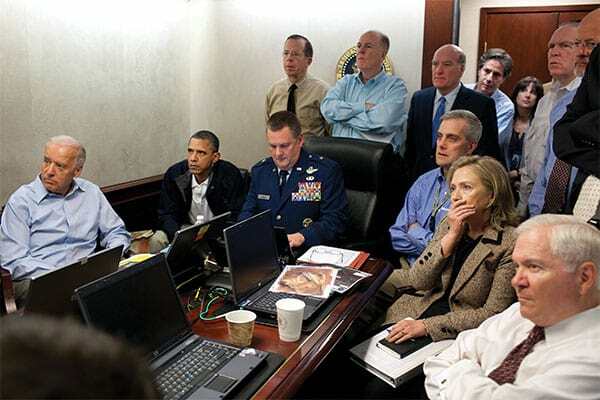 There has been only one top to bottom renovation of the Situation Room, taking place from 2006 to 2007. 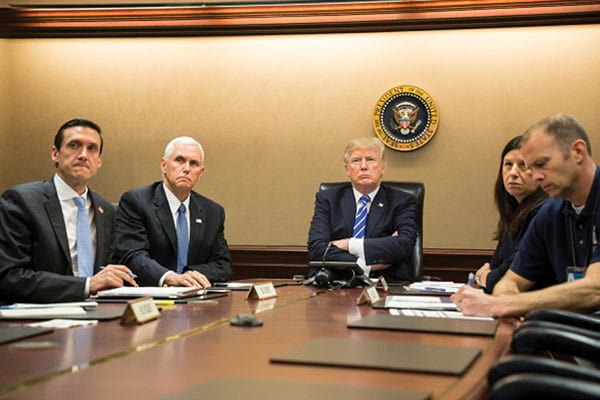 It was a massive project and after its conclusion allowed the Situation Room to not only house the National Security Council but also the Department of Homeland Security and the White House Chief of Staff’s office. These changes also helped to update security and communications technology. Pre-renovation the Situation Room used technology rooted in the year 1985 which could lead to misinformation or a breakdown in communication in today’s digital age. The room was completely rebuilt from the bricks up, both due to the amount of ancient technology blocking the way of new technology being implemented, but also so that they could have a much easier time renovating in years to come. 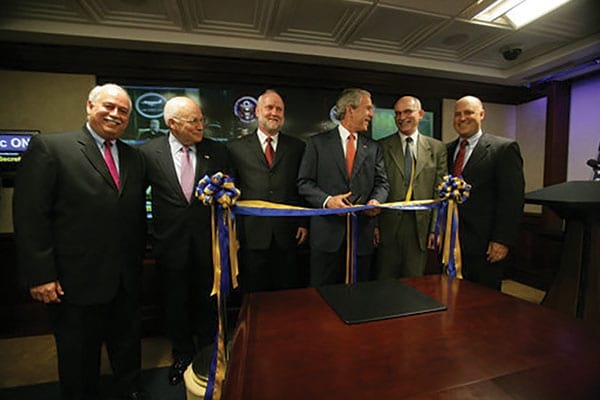 In May of 2008, the newly renovated Situation Room was unveiled, including a beautiful main conference table accessorized with ourBlack Leather Conference Table Pads. Since then, they’ve been in-use protecting the meeting table from the daily wear and tear of the operations of this busy, pivotal conference facility. The Situation Room hosts roughly 25 regularly-scheduled conferences a day, with approximately 250 regular attendees. 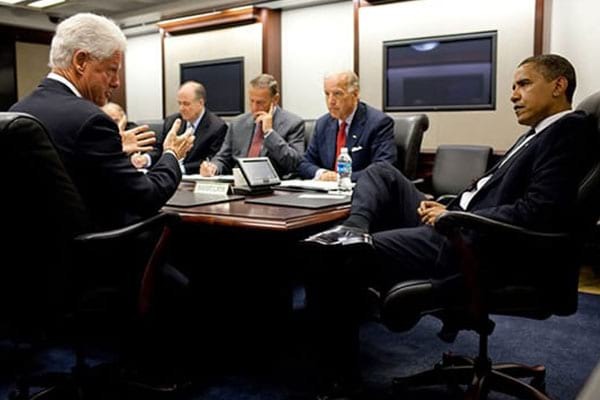 It is a testament to the longevity and durability of the Dacasso Black Leather 17 x 14 Conference Table Pad to be in near constant use throughout 3 presidential administrations without being replaced. 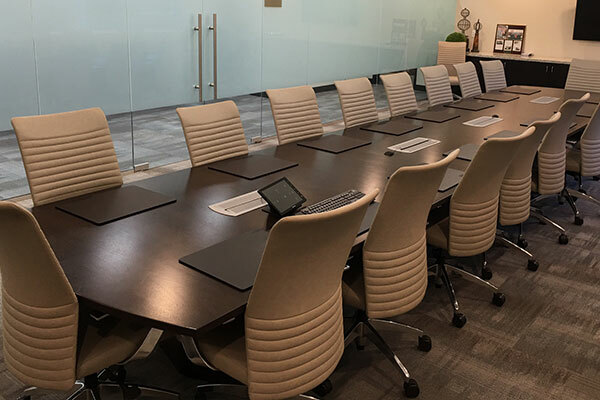 It is truly an honor to have our conference room accessories used in one of the highest-profile offices in the land, and we'd love to bring the same level of function and beauty to your conference facility! Accessorizing a conference room isn't always a simple task! If you're like most people, you haven't put much thought into the different types of accessories and table pads that are available today. Decorating a conference facility isn't something most people do very often, so it's understandable if the wide range of available accessories seems a bit overwhelming. 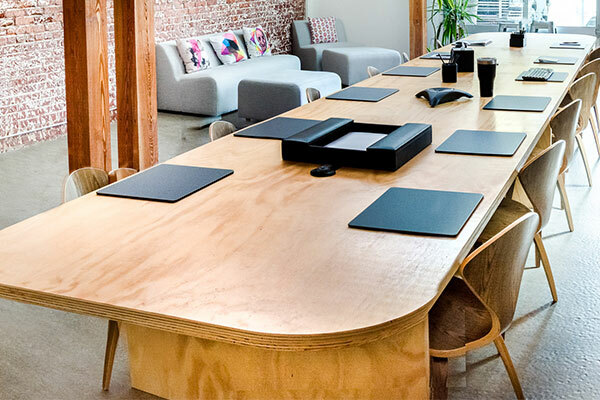 Which type of table pad will work best for the way you use your conference room? What pad or placemat size will work best on your table? How do you choose the best material? If you haven't spent a lot of time and effort researching conference room accessories, the answers to these questions aren't always obvious. Here at The Elegant Office, we've been working with our customers to create outstanding conference environments since 1999. We're happy to offer some unique tools that let you leverage our years of experience and product knowledge! Table pads, mats, or placemats are almost always the first accessory customers add to their conference facilities. Choosing the right size and shape can be tricky, especially when shopping online. Without seeing the products in person, it can be tough to visualize the pads in-use on your table. This purchase is an investment, and you want to get it right the first time. We offer a tool that’s proven to help many clients make a more informed purchase: our Conference Table Renderings. Here you’ll find illustrations showing a range of tabletops in different sizes and shapes with conference table pads. These renderings are drawn to scale, so it’s easy to see the number of seats/pads and the spacing for each. If you don’t see the table size or shape that replicates yours, let us know and we’ll gladly create a rendering for you. The images below provide a comparison…the rendering to actual product in place. The approach we take with our clients might not be what you’re expecting from an online retailer. We’re here to share our product knowledge and offer complimentary services designed to aid in the navigation of options and determine what best suits your needs. Expert help and guidance for decorating and accessorizing your conference room is just one of the many perks of working with the sales team at The Elegant Office. Being able to speak directly with an experienced professional is a priceless tool that is hard to find in today's market. If you are seeking to outfit your conference room or workspaces, please do not hesitate to call us today - 866-433-7573.